Always hungry Fathom intern and Queens native Daniel Schwartz satisfies his travel bug and his empty stomach at every meal. 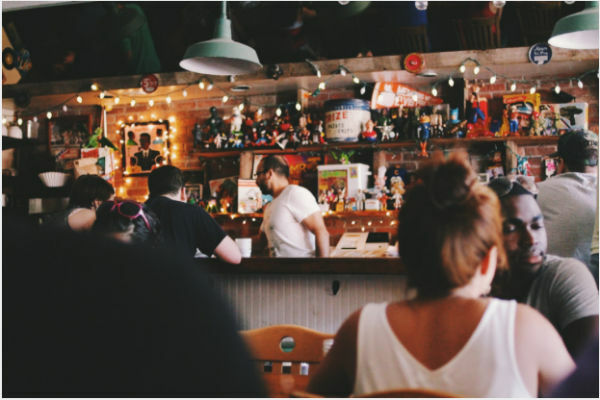 Here's a working list of his favorite local eateries with global flavor. QUEENS, New York City – I'm lucky. And I'm reminded of it every day on the walk to the train. I live in one of the most diverse urban areas in the world, the great New York City borough of Queens, and I've been traveling country to country through meals long before I ever stepped foot on a plane. After every trip abroad, I appreciate my hometown restaurants more because they're authentically ethnic and only a train ride away. So ditch the Manhattan suit and Brooklyn beanie and wear something you'd travel in. The food in Queens will take you places. Grab a seat. Photo courtesy of Zaab Elee. Unless you're tight with a local or ran a dedicated Google search, you will never find this Tibetan gem. I've walked by the Tibet Mobile cell phone storefront thousands of times but only recently peeked past the blockade of for-sale saris and walked down a side hallway lined with unkempt racks of Himalayan DVDs. That's where I discovered a large portrait of the Dalai Lama, a small kitchen, and a few skeptical Tibetans. A tiny TV played Tibetan pop, and photos on the wall helped me decipher the incomprehensible menu. I pointed my order to the sweet chef, who prepared my usually-frozen momos (Himalayan dumplings) by hand. As I sat on a fold-up chair, sweating from the special hot sauce, chewing on tingmo (steamed bread), and drinking salty butter tea, I thought: I'm so glad I found this place. A cheap sweets and snacks shop in between all the great Indian restaurants in Jackson Heights. Mithai, or Indian sweets, are bold, colorful, and very sweet. Jalebi, a saffron-color, syrupy funnel cake, and falooda, a milkshake with vermicelli noodles, basil seeds, and rose syrup, are good first-time choices. Grab a samosa sandwich and walk 74th St. for a make-believe Mumbai experience. Friends commute across boroughs for Sammy's chicken over rice. I've always lived within walking distance of the Vendy award-winning cart, so I thought they were nuts. Then I thought about the red-tinted chicken, the fresh flavors of the Middle East, and the oddly perfect green sauce (not found at most halal carts) that I've been spoiled by. They're not crazy. 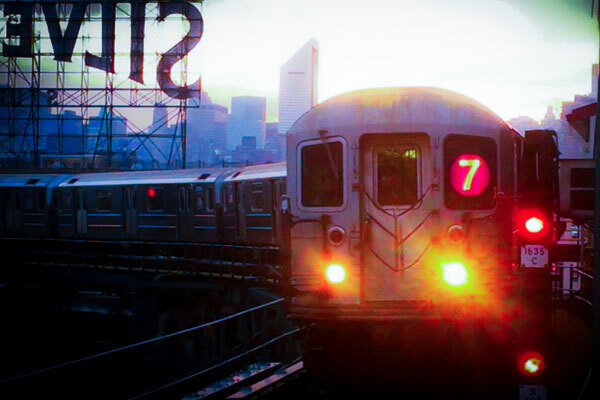 It's worth the stop at the 74th St. station. No pad Thai. No drunken noodle. 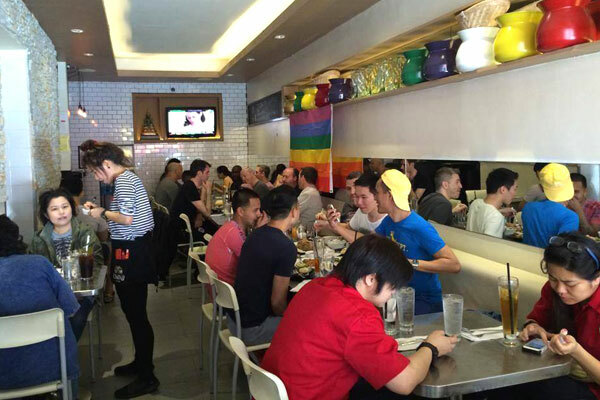 There are hundreds of other spots serving those well-known, Central Thai dishes. Zabb is an upgrade from ordinary Thai restaurants. It's Esarn cuisine from North Thailand and Laos, and it can get appropriately spicy. They import their chilies from Thailand, unlike other joints that import from Mexico. A two out of five on their spicy scale is pleasant for beginners. A five out of five makes most Thai natives cry. Som tum (spicy papaya salad), Esarn sausages, and dark, rich broths are tasty ways to get in touch with the gastronomically overlooked region. Get comfy. Photo courtesy of Queens Comfort. Food to get down and dirty with. Photo courtesy of Queens Comfort. 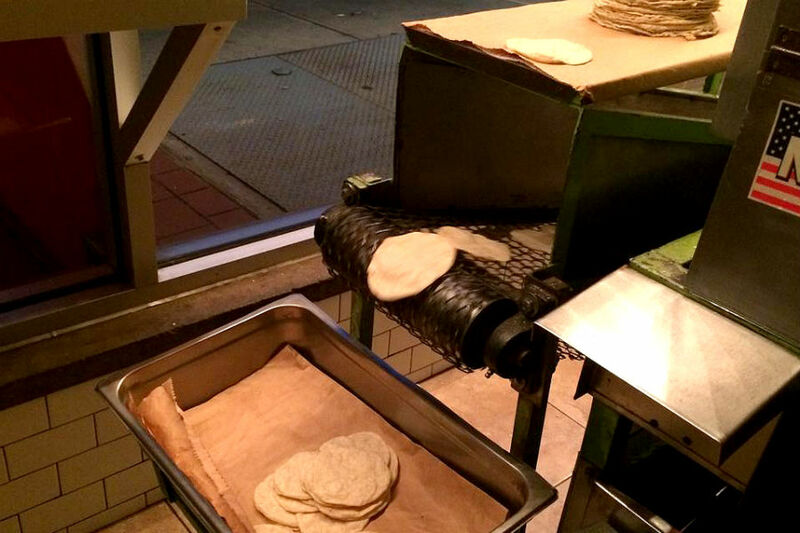 Fresh tortillas all night long. 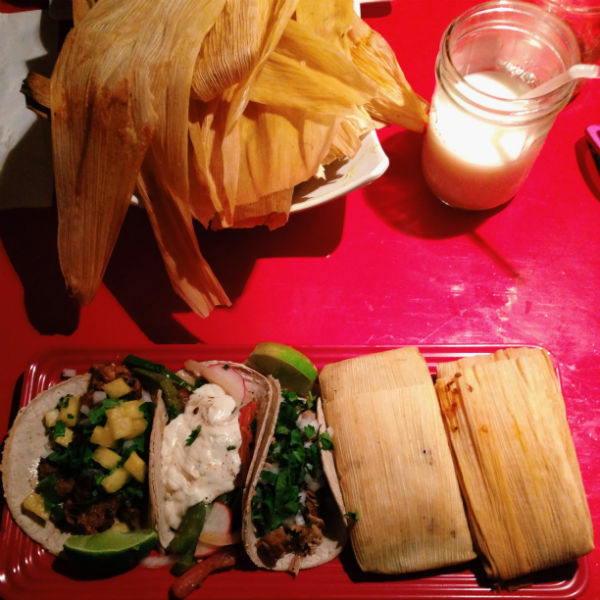 Photo courtesy of Tortilleria Nixtamal. Sadly, always filling. Photo: Daniel Schwartz. Arepa de chocolo con pollo. Before the sauce deluge. Photo: Daniel Schwartz. 77-02AA Roosevelt Ave., Jackson Heights; no phone. 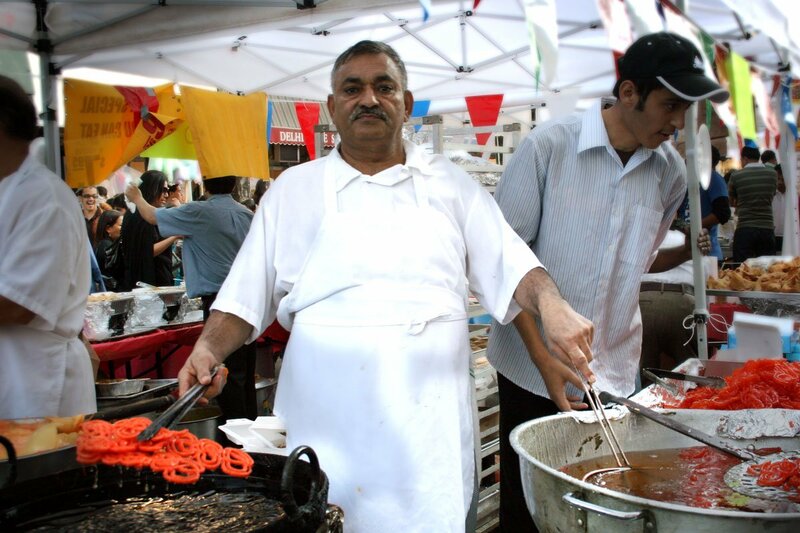 Cart near 79th St. and Roosevelt Ave.; Saturdays and Sundays only (check Twitter). My mother has been making arepas every morning since she was twelve, and I've been eating her arepas every morning since before I can remember. Mom's are authentically Colombian — flat, thin, corn-only bland, and served as a side. 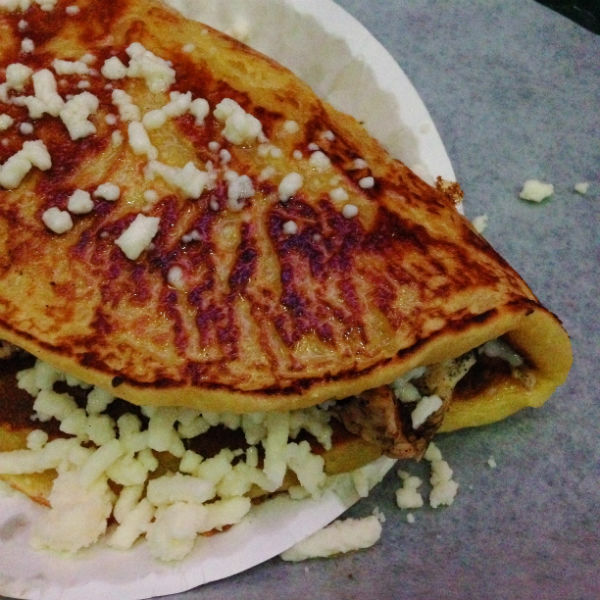 When her stock is out, or it's 3 a.m., I head to the Arepa Lady for her saucy, gooey, thicker spin on the corn cake. Throngs of salivating customers flock from all over (including regulars from Westchester) for arepa de queso (cheese-infused corn cake best drizzled with condensed milk) and arepa de chocolo (ground fresh corn cake stuffed with cheese and meat and drizzled with garlic, hot, and pink sauces). Because at 3 a.m., she's everyone's Colombian mother. Heart-stopping soul food with punk personality. Lil Dizzy is a Cap'n'Crunch fried chicken po-boy. Sugar Hill is pecan praline-bacon on eggs Benedict. Atomic Fireballs are deep-fried mac 'n' cheese with sriracha. The space is homey, BYOB, and packed for brunch. 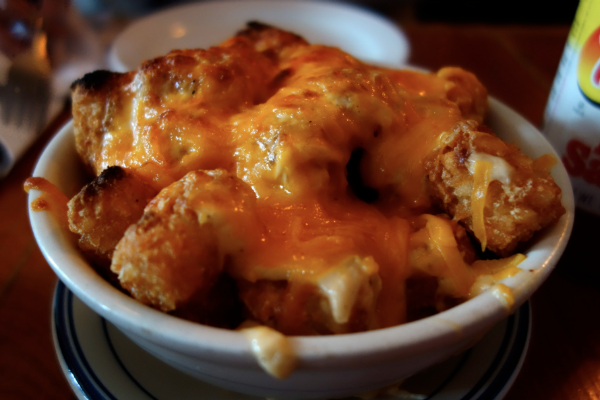 With an awesome staff and soothing Southern food, it's easy to become a regular. But think of your health. Or don't. Corn undergoes nixtamalization, is ground into masa, and passes through the on-display tortilla machine every day. (You'll want to watch it in action). Masa is packed into tamales, fried (as tortilla) into thick chips, and dropped into white pork broth for pozole soup. The routine is exclusive to Nixtamal, the only masa-making Mexican restaurant in NYC. They supply corn flower and tortillas to Dos Toros Tacos, Whole Foods, La Esquina, and many other tri-state area joints. Their house salsas are deeply flavorful, and anything with corn and slow-stewed meat can't be beat. I pray at every visit that my usual three-taco, two-tamale meal won't fill me up, just so I can continue to stuff myself with other goodies. Photo courtesy of The Thirsty Koala. Aussie accents. Kangaroo sliders. Lamb lollies, homemade goat cheese, and beet-topped burgers. They even have Lamington and Pavlova. While in Sydney, Aussie friends wouldn't shut up about the cakes until I bought packs of each to try and take home. Until I return, a cider, a slider, and a sweet treat at this place will do. Hey, flaky delicious. Photo courtesy of Djerdan Burek. The good life in a Queens back garden. Photo courtesy of Il Bambino. It's hard for Greeks to agree on the best Greek food in Astoria. It's either their yiayia or one of many top-quality joints. The well-fed Greeks I trust side with me on Agnanti. And so do many lucky Astoria Park locals who fill themselves with rooster pasta, ntakos (Cretan cheese-topped bruschetta), grilled octopus, and saganaki (flaming fried cheese). This Queens-kid will gladly hop on the N for a late lunch, a view of the scary-close Hell's Gate Bridge, and a walk along the river. A celebration of Czech and Slovak culture and cuisine. The Bohemian Hall predates the adjacent beer garden and was established in 1910 to support immigrants and ancestors from the region and preserve the culture. The garden helps the cause by cranking out old-world favorites like smoked pork knee, bacon-egg-and-cheese-stuffed schnitzel, and bryndzové halušky (potato pasta with Slovak sheep cheese) that pair perfectly with cold pitchers of Staropramen or Pilsner Urquell. Gravy-soaked bread dumplings take on a new level of delicious after a few rounds. Cannelle serves fantastic French food and pastries where you'd least expect to find them, tucked away in the corner of a strip mall on the outskirts of Jackson Heights. The roomy cafe is always packed with a mix of old European loungers and young pastry fiends, as well as the occasional party-planner (me) picking up one of their decadent cakes (for myself). Everything is delicious, but the rich hot chocolate, seasonal quiches, and chocolate croissants from Brittany-born pastry chef Jean-Claude Perenou are worth the 20-minute trek from the train. 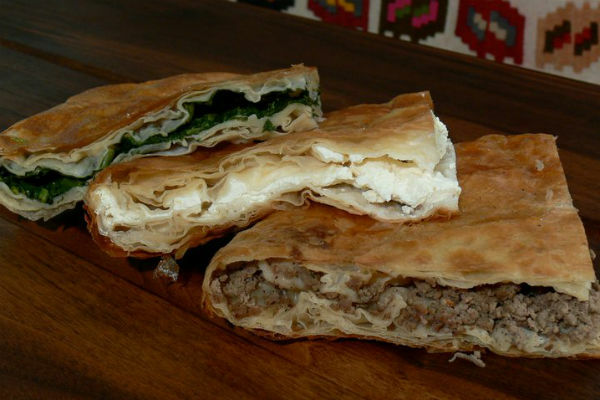 Nothing beats the home-cooked food I ate in Serbia, but when I want a reminder of the region, I go to Djerdan for bureks — fat, flaky, phyllo-dough pies filled with meat, cheese, or spinach. It's traditional Bosnian fare found in one form or another throughout the Balkans. Ćevapi, little tubes of minced meat served with onions and ajvar (a red pepper paste), crêpe-like palačinke, and kokos torta, a coconut-covered, cream-filled chocolate cake, bring me back to simpler times. 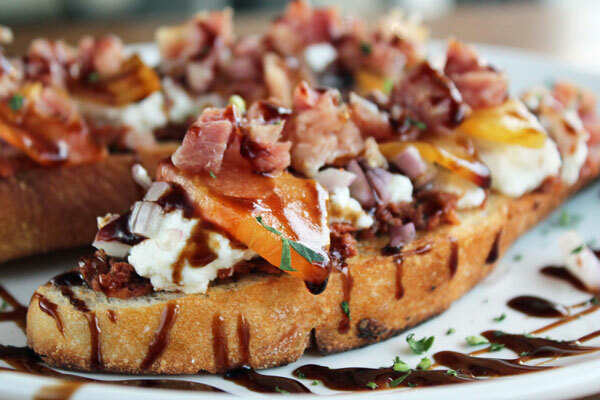 The frequent flyer chefs at Bambino come up with eclectic, delicious panini ideas that reflect their infatuation with Northern Spain and Italy. Finnocchiona, fontina, scallion aioli. Speck, apricot butter, taleggio. The list goes on. And they have creatively-named, heavy weekend brunch panini. 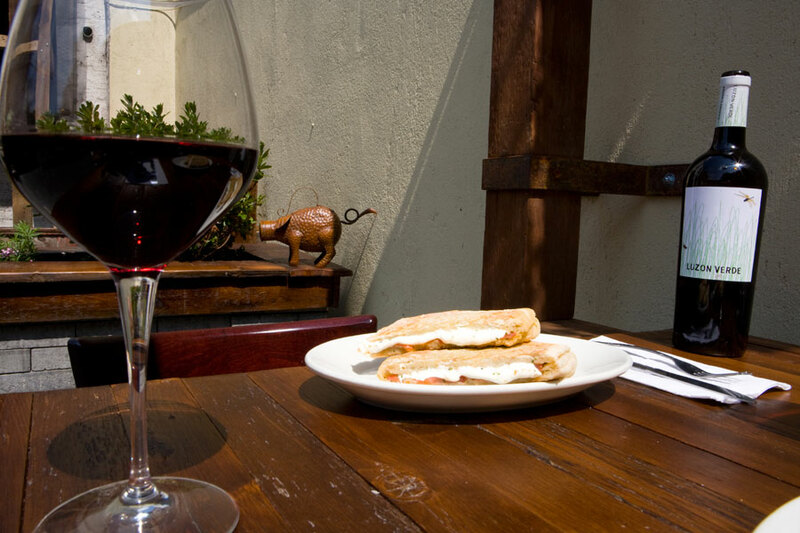 Their back garden is perfect for drinking wine and trying out new combinations.